Karan Johar Requested to Prabash Debut in "Shuddhi"
Home News Culture Karan Johar Requested to Prabash Debut in "Shuddhi"
Director, VJ & Producer Karan Johar has been trying to make South Indian superstar Prabasas debut in the Bollywood Movie.But earlier in the film, Prabhas had refused the proposal of Karan Johar's sacrifice. Karan Johar is preparing to make the film 'Shuddi'. Karan, who is looking for the main actor of the film, has proposed Prabhas again this time. Indian Young Superstar Prabas, who has also made Special identity in Bollywood from the movie 'Bahubali' series, also premiered in the Hindi language, is now preparing to come through the audience From new movie 'Saaho'. Karan Johar has been working for the upcoming hindi movie 'Shuddi' since 3-4 years. But, because of the different subjects of the film, the star artists of Bollywood are not able to work in "Shuddi". Bollywood Hhritik Roshan, Salman Khan and Barun Dhawan had been offered as an actor for this film. But none of these 3 star could dare to this movie. Karan Johar's Dharma Production Company plans to build the film "Shuddi" in 2019 or 2020. Recently Karan Johar has started talks with Bahubali Super Star Pravas for this film. 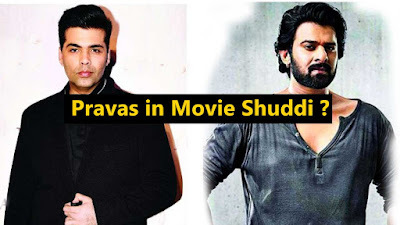 Prasas, who came to Mumbai for the celebrity chat show 'coffee with Karan ', Karan Johar, has requested to play lead role in his movie Shuddi. But Prabbas did not give Fact response. According to Indian media, Prabashas asked for some time to descide for this film. If Prabhas made a debut in the film Shuddi, his fan would definitely be happy in Bollywood. Earlier, many star's of Sound Indian movie have debut in the Mumbai film industry.